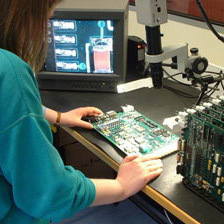 PCB Production - PCB Services - Cope Technology Ltd. The advantages of having a dedicated electronics manufacturing facility at your disposal are readily appreciated in today’s technically hungry world. With 8,000sq ft of production, purposely designed for electronics manufacturing, Cope Technology provides you full process capability when you need it, with no cost overhead when you don’t.